Work generally involves a felling gang or harvester, and extraction of timber by forwarder. In many circumstances, forestry operations can have a great physical and visual impact, depending on how extensive the work is. 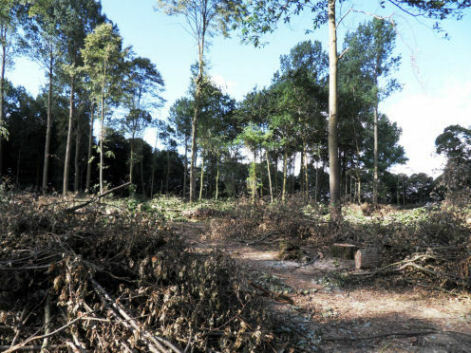 Over larger felling areas, the site can look a “mess” initially. But a mess in natural systems is opportunity for regeneration if stools are protected, and if sufficient parent trees remain to seed into the variation of microsites which result. Germinating seedlings will establish rapidly with the help of an existing and undamaged mycorrhizal network. Variation in seedling ecology is further enhanced by sensible brash management during operations. Where fencing may not be necessary, brash will also protect against low level deer browsing. Alternatively electric fencing or other forms of protection may be necessary. The aim is to have a new generation of trees establishing. Species variation may be enhanced or ultimately changed by planting at low densities amongst the matrix. It is worth spending a bit of time and money on this enrichment planting, to ensure the sapling gets the very best start. Strategic positioning of plants between stools is important, as is a forking of the soil to decompact in the planting zone. 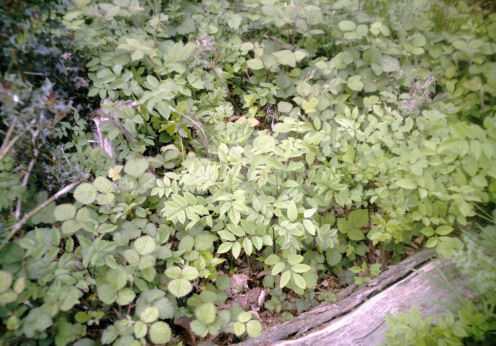 Over time, dormant bramble may develop, replacing the decaying brash as protection for established saplings. Good sites will see tremendous emergence of vegetation in the first five years. Rapid growth of some species will be at the expense of others as natural succession begins in the first wave, and canopy closes. Slower growing species may need to be given a helping hand to avoid being overtopped, though side shading encourages the development of good form in trees. The whole site is absorbing carbon in the bodies of new trees and shrubs, replacing the carbon taken from the previous extracted crop. Especially in wet conditions and on heavy land, tractor and machinery movement compact the soil, affecting its structure, and reducing movement of moisture, gasses and minerals. It also creates a physical pan which makes it difficult for the roots to penetrate, and for the movement of other beneficial soil fauna. On light soils the impact is reduced, to the rare or possibly academic point where pure sand will be unaffected by heavy machinery. Compaction in clays and loams is not permanent though. Summer drought and evapo-transpiration deeply crack clay soils and break the pan. Re wetting in subsequent winters swells it again, and over a long time, the repeated process restores original condition. Unless the season is exceptional though, it is always preferable to restrict movement of machinery to dry conditions, and the use of brash as a mat where possible reduces compaction and damage to soil structure.